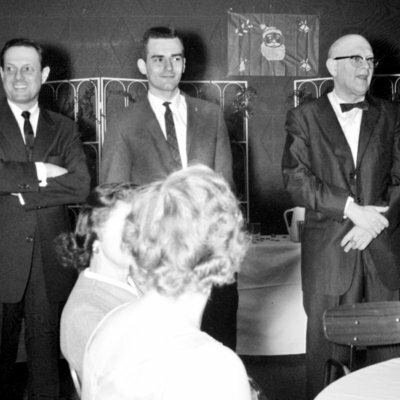 Dr. Robert Reid, Director (appointed), Ronald Drum, [and] Professor Hyman Feinstein at the 1963 Christmas dance. Photograph by Richard M. Sparks of the 1963 Christmas Dance. Shown here from left to right are: Dr. Robert Reid, George Mason College student, Ronald Drum, and chemistry professor Hyman Feinstein, December 9, 1963. Moving out of Bailey's Crossroads Elementary School building, August 1964.